Chef-owner Ryan Garlitos is on a serious mission to boldly go where no Filipino restaurant in O.C. has gone before: upscale fusion. 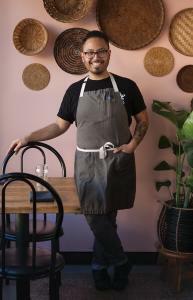 The exploration that began as Irenia Supper Club pop-ups is now Irenia Restaurant, open since May in downtown Santa Ana. 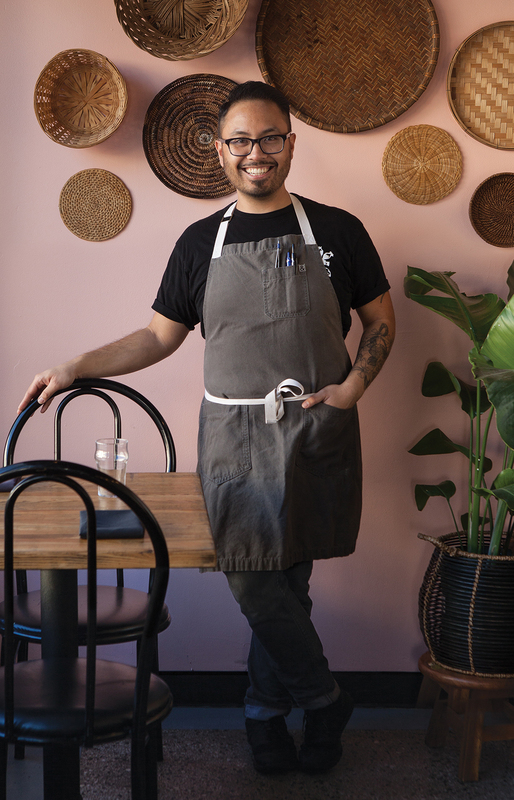 Inspired by four years at Carlos Salgado’s breakthrough Taco María, Garlitos builds a cuisine from his grandmother Irenia’s cooking—distinct Filipino flavors, modern techniques, and local provisions. The results are challenging, delicious, and exciting. Modern fusion is a tricky niche to own given Pinoy restaurants are already underrepresented in O.C. What few options exist tend toward turo-turo (“point, point”) buffets aimed squarely at homeland comfort cravings. 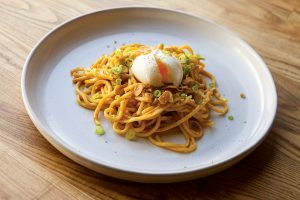 And for a significant segment of Irenia’s diners, Filipino flavors are an unfamiliar mashup of sour, salty, sweet, and funky. Dishes, while complex and layered, can also be loud and proud. Dilis (fried baby anchovies) are a good example of snacking at high volume. A generous pile of silver-gold crispy little fishies are as crunchy as tempura cracklings but pungent as heck. A quick dip in the accompanying spiced vinegar tempers the funk, but only by adding a sassy layer of tart. One order is plenty for four. Ditto for mani, peanuts roasted in their shells and coated with sweet vinegar, sea salt, and harissa you will be licking off your fingers after wrangling the nuts from leather-tough shells. The nuts are surprisingly not crunchy; they’re supple, the texture of edamame. Garlitos wisely keeps his menu short and seasonal, telling his story with a dozen dishes. The kitchen here, at what previously was the North Left and before that The Crosby, is notoriously small. Tight focus on select dishes that play by the seasons means some of the items described here will be out of rotation for now, or perhaps modified with cool-weather produce. Expect the roasted cauliflower with ripe mango bits and crunchy sunflower seeds to stick around, though. That’s good news, as Garlitos provokes complexity from the relatively season-proof dish with what he calls his “moleXO.” This pasty, rust-hued sauce fuses fiery chiles, fragrant ginger, feisty garlic, funky fish sauce, and longganisa sausage in a profound nod to both hemispheres. Alas, another standout side, ginataan corn, won’t be back until summer. Fresh corn, just-sheared from the cob, is the juicy, sweet base for a coconut-corn purée doused with lime juice. Scarlet dribbles of chile oil bring welcome heat, or at least serve as a visible warning to chile-phobes. The pancit is a soothing construction of vermicelli noodles, unctuous uni, and soft-boiled egg, with crispy pizazz from sizzled garlic and crumbled, fried chicken skin. 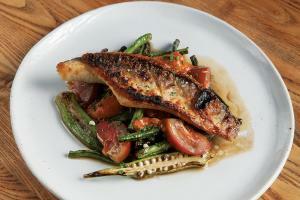 Though it’s listed as a small plate, this rich dish could easily work as an entree. 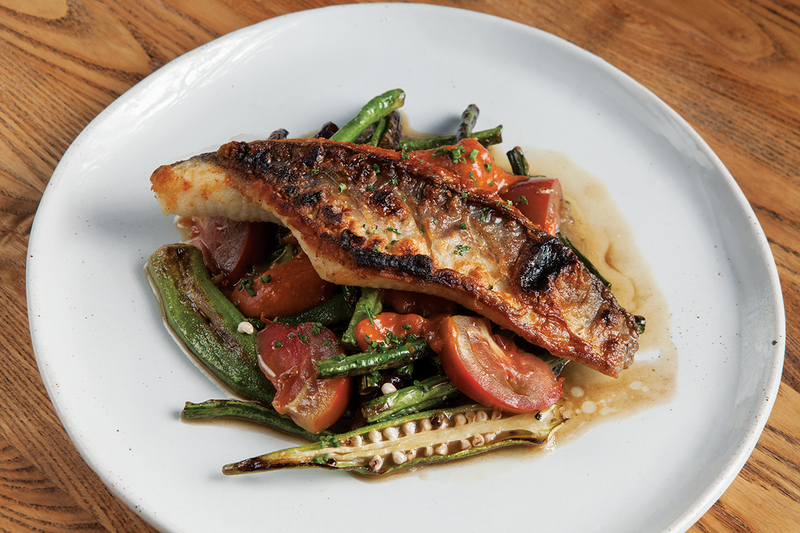 Inihaw na paltat is deftly grilled catfish, white and flaky, from California’s esteemed Passmore Ranch. Heirloom tomatoes, Asian greens, and roasted Japanese eggplant accompany the mild flesh for a colorful presentation, though the vinaigrette clobbers the ingredients’ gentle notes. Next time, I’ll request a light hand on the sauce. Two entrees I would gladly order this minute include the chicken inasal and the pork adobo. Both offer a measure of familiarity, but their strength is their deliciousness. Don’t expect the adobo to be stew-like. Rather, the pork belly chunks are juicy on their own, slowly rendered in a marinade of garlic, soy, and vinegar. The inasal uses Jidori chicken thighs, pan roasted and bathed in a gravy (more a glaze, really), redolent of ginger, citrus, and warm spices that set off the intense dark meat. Garlitos serves it with roasted squash and glossy Chinese broccoli. I love this chicken all the more at lunch, when it’s served in a bowl with lovely jasmine rice. Cool days are ideal for a steamy bowl of sinigang, an elegant clear soup with tamarind dashi, braised daikon radish, and a few bright green beans. Two godsends inherited from previous tenants include a superior sound system and a full bar. Those killer speakers allow an inspired playlist to set the scene without impinging on conversation. 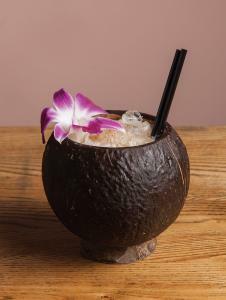 And the full bar, which is rarely bustling, inspires darn-good cocktails that are original enough to complement the thoughtful menu. All are well-made, but it’s hard to resist the spirit-forward house Old-Fashioned, with rye, bitters, and palm sugar. The Bottle Rocket—with mescal, ancho chile, tamarind, and mango, ending with Tajín—is also worth trying. And piña colada fans must try the Petite Colada, a refined concoction with corn whiskey, Madeira, toasted coconut, and nutmeg. A careful but small list of beers and wines demonstrates attention to all the flavor profiles beloved in this kitchen. 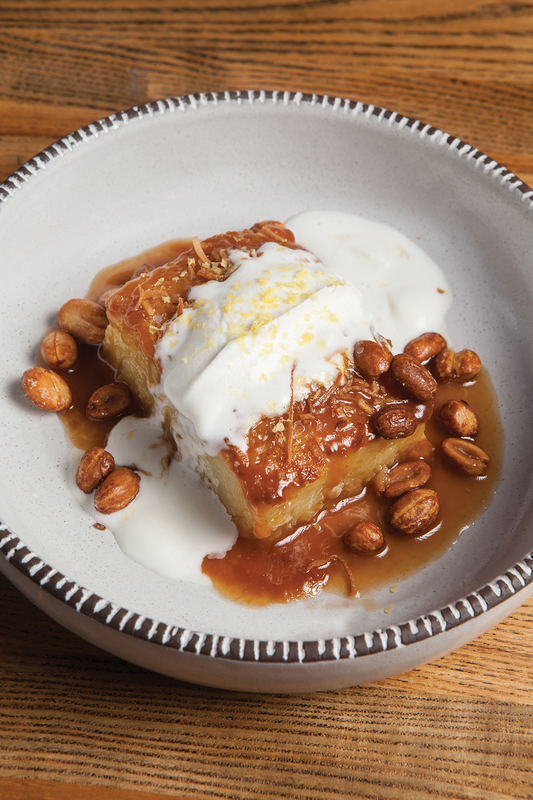 Garlitos leaves room for desserts by pastry diva Ashley Guzman, herself a Filipina. 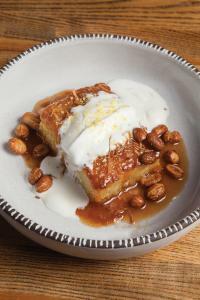 Toronado is an elaborate dish with crunchy lumpia filled with sweet chocolate rice pudding flattered by cool banana semifreddo and peanut-brittle shards. In her frequent rotation, my favorite so far is her sophisticated ube brown sugar pie, a dense oat-crust tart with a ribbon of purple yam filling beneath a thin custard, set off by an oval of perfect hand-whipped cream. It’s pretty and irresistible. Sheer bravery aside, Garlitos and his gracious crew seem crazy-happy to serve fare that oozes soul and inspiration. I swear I could taste meaning in every bite, even when some were better than others.